I am assuming these are possibly a continuation of the Angel Frieza and Goku Tag Fighters figures, but they may be unrelated. I don't collect figures this size, but based on pics I have seen of the prototypes, these are the best sculpted figures for Dragon Ball Super I've seen to date, and I say that mostly because they have the best looking SSB Gogeta figure of any I've seen. 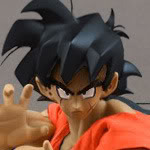 The SSB Gogeta is really tempting me to buy it, but at $32+ that's more expensive than I am willing to pay for a statue. eKnightMedia has all of these up for pre-order FYI. They release at the end of July, so more likely August 2019. I'm finding it VERY HARD to believe there isn't a non-SS Broly vs. SSG Vegeta in this lineup, but maybe they aren't finished yet. I'm very impressed with them, but especially the Gogeta. anyone know what size are these? wondering if that ssj broly is compatible with figuarts? ?